Proactive villagers of Pavlivka have lots of development plans for their community and they are always happy to share their thoughts and ideas with others. They often host other communities and delegations of officials to demonstrate fruits of their work. 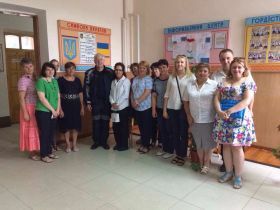 In July they were honoured to welcome Mr Neal Walker, UN Resident Coordinator and UNDP Resident Representative in Ukraine. During his visit, the community showed guests newly reconstructed school for junior kids and a street lighting system. They also shared their plans for future like the reconstruction of the sports gym, which they already initiated with the support from the State Fund for Regional Development.